Richmond out of hours nhs web design was built on WordPress using a theme we built for the East Berkshire out of hours website. 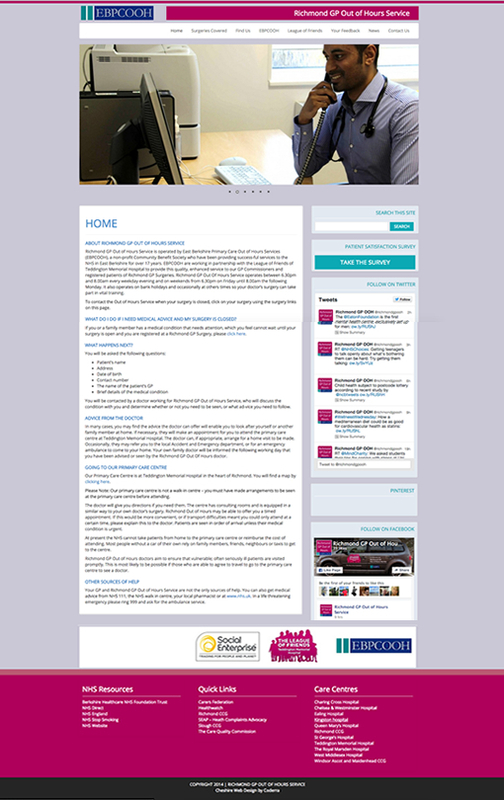 The nhs web design has it’s own individual colours but the layout is pretty similar to the East Berkshire site. This website has heavy social media usage in the sidebar. The admin also makes great use of the blog facility, adding new stories regularly. The web site was built using advanced custom fields to make the content areas easy to manage. This nhs web design is primarily used to provide out of hours information for patients. To do this we created pages for each surgery containing their contact information and address. We also added a personalised Google map per page that allows the visitor the get directions to the surgery they are looking at. These can all be administered from the WordPress dashboard like any post or page. New maps and surgeries can be added as easily as news articles. The website is completely responsive to mobile devices, shrinking down and reshaping for mobiles and iPads. This helps with user experience as well as with on page SEO for google rankings. The nhs web design is clean and crisp with a clinical feel that fits in with the purpose of the website. The website shows Pinterest, Facebook and Twitter feeds so share content, and promote their brand. One of the great things about this website is that all of the images are their own. This has a greater effect on the design as it feels more natural. Visitors to the website can also instantly know they have come to the correct place. The navigation is clear and users can get to the information they need within 3 clicks. This makes sure that user experience is really good, ensuring repeat visitors.